Capital Project Plans is a configuration of the Minimal Gallery that includes a collection of Web AppBuilder for ArcGIS applications used by project leads to organize new capital project plans and revise project information during the planning process. Capital projects are typically defined for water, sewer, stormwater, and transportation assets in a community; and used to maintain, improve, and/or enhance public assets. To deploy Capital Project Plans with the ArcGIS Solutions Deployment Tool requires specific software. To manually deploy Capital Project Plans in your organization requires specific software. Applications Capital Project Plans An application that includes a collection of applications used by project leads to organize new capital project plans and revise project information during the planning process. Water Project Plans An application used by project leads to organize new water capital project plans and revise project information during the planning process. Sewer Project Plans An application used by project leads to organize new sewer capital project plans and revise project information during the planning process. Stormwater Project Plans An application used by project leads to organize new stormwater capital project plans and revise project information during the planning process. Transportation Project Plans An application used by project leads to organize new transportation capital project plans and revise project information during the planning process. Park Project Plans An application used by project leads to organize new park capital project plans and revise project information during the planning process. Facility Project Plans An application used by project leads to organize new facility capital project plans and revise project information during the planning process. Other Project Plans An application used by project leads to organize new other (IT, misc.) capital project plans and revise project information during the planning process. Maps Water Project Plans A map used in the Water Project Plans application to organize new capital project plans and revise project information during the planning process. Sewer Project Plans A map used in the Sewer Project Plans application to organize new capital project plans and revise project information during the planning process. Stormwater Project Plans A map used in the Stormwater Project Plans application to organize new capital project plans and revise project information during the planning process. Transportation Project Plans A map used in the Transportation Project Plans application to organize new capital project plans and revise project information during the planning process. Park Project Plans A map used in the Park Project Plans application to organize new capital project plans and revise project information during the planning process. Facility Project Plans A map used in the Facility Project Plans application to organize new capital project plans and revise project information during the planning process. Other Project Plans A map used in the Other Project Plans application to organize new capital project plans and revise project information during the planning process. Feature layers InfrastructureProjects A feature layer used to store infrastructure projects identified by project leads responsible for maintenance and improvement of public infrastructure. 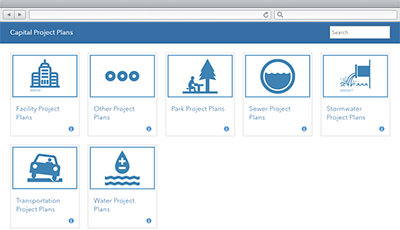 InfrastructureProjects_waterprojectplans A feature layer view of the InfrastructureProjects layer used by project leads to organize new water capital project plans and revise project information during the planning process. InfrastructureProjects_sewerprojectplans A feature layer view of the InfrastructureProjects layer used by project leads to organize new sewer capital project plans and revise project information during the planning process. InfrastructureProjects_stormwaterprojectplans A feature layer view of the InfrastructureProjects layer used by project leads to organize new stormwater capital project plans and revise project information during the planning process. InfrastructureProjects_transportationprojectplans A feature layer view of the InfrastructureProjects layer used by project leads to organize new transportation capital project plans and revise project information during the planning process. InfrastructureProjects_parkprojectplans A feature layer view of the InfrastructureProjects layer used by project leads to organize new park capital project plans and revise project information during the planning process. InfrastructureProjects_facilityprojectplans A feature layer view of the InfrastructureProjects layer used by project leads to organize new facility capital project plans and revise project information during the planning process. InfrastructureProjects_otherprojectplans A feature layer view of the InfrastructureProjects layer used by project leads to organize new IT, misc. capital project plans and revise project information during the planning process. ExternalAgencyProjects A feature layer used to store capital projects planned by external agencies or private utilities. ExternalAgencyProjects_public A public feature layer view of capital projects planned by external agencies or private utilities. PavementMoratoriums A feature layer used to moratoriums issued on newly paved streets that preclude, or restrict, right-of-way activity. PavementMoratoriums_public A public feature layer view of moratoriums issued on newly paved streets that preclude, or restrict, right-of-way activity. Group Capital Project Plans A group required to configure the Minimal Gallery application and deliver a collection of applications used by project leads to organize new capital project plans and revise project information during the planning process. Below are the release dates and notes for Capital Project Plans. An enhancement to the InfrastructureProjects feature layer views to filter out completed projects. Added ExternalAgencyProjects and PavementMoratoriums layers as reference layers to the Capital Project Plans maps. Support for ArcGIS Pro 2.2 and ArcGIS 10.6.1. Support for Minimal Gallery configurable application template.